To assess the current state of the marine planktonic ecosystem by providing benchmarks of its present state for the future assessment of climate change. To improve the knowledge base and understanding of the impacts of climatic and anthropogenic change on planktonic ecosystem structure and function. To improve the ability to model and project future marine ecosystem states. To apply the ecosystem approach to GreenSeas data to derive a suite of indicators of which describe changes in ecosystem function. and three technological and communication objectives. 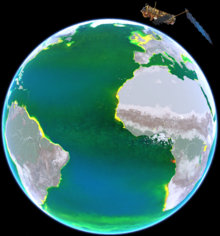 To improve the technology for accessing historical plankton and associated environmental data sets, along with earth observation data and simulation outputs. To enhance international cooperative links with other plankton monitoring and analysis surveys around the globe. GreenSeas shall advance the quantitative knowledge of how planktonic marine ecosystems, including phytoplankton, bacterioplankton and zooplankton, will respond to environmental and climate changes. To achieve this GreenSeas will employ a combination of observation data, numerical simulations and a cross-disciplinary synthesis to develop a high quality, harmonized and standardized plankton and plankton ecology long time-series, data inventory and information service. The focus will be on capturing the latitudinal gradients, biogeographical distributions and provinces in the planktonic ecosystem from the Arctic, through the Atlantic and into the Southern Ocean. It will build on historical data-sets, and ongoing multidisciplinary ocean planktonic ecosystem monitoring programs, enhanced where possible with an emphasis on the Southern Ocean. GreenSeas will also enhance international cooperative links with other plankton monitoring and analysis surveys around the globe. The heart of the GreenSeas concept is establishing a ‘core’ service following the open and free data access policy implemented in the Global Monitoring for Environment and Security (GMES) programme. Using state-of-the-art web-based data delivery systems the ‘core’ service will make available both new and historical plankton data and information products along with error-quantified numerical simulations to a range of users. Connecting with ‘downstream’ services GreenSeas will moreover offer ecosystem assessment and indicator reports tailored for decision makers, stakeholders and other user groups contributing in the policy making process. Finally, knowledge transfer will be guaranteed throughout the project lifetime, while the legacy of the GreenSeas database web-server will be maintained for at least 5 years beyond the project lifetime.